St Mary Magdalene’s well, Ffynnon Fair Fagdalen, at Cerrigydrudion could be a beautiful little well with a little care and attention. As it is, it seems an almost forgotten treasure. 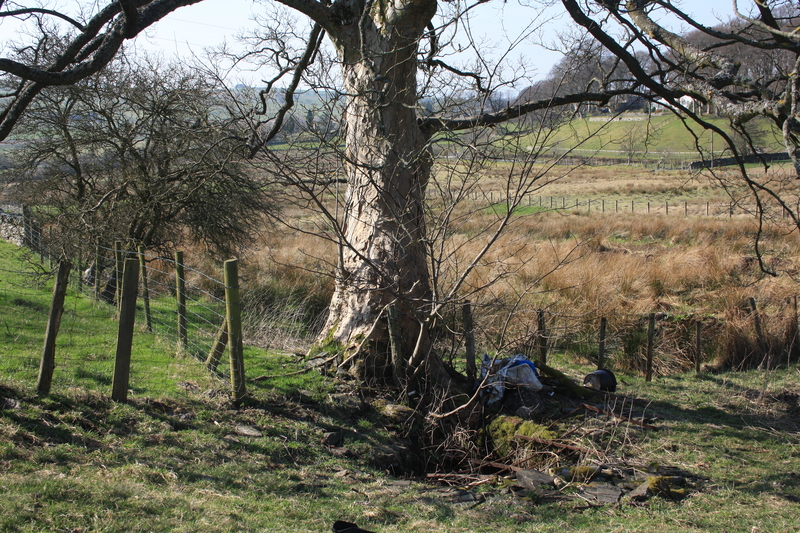 There was apparently an attempt some 10 years ago by members of the Dry Stone Walling association to restore the well, so the structure appears relatively and surprisingly intact. 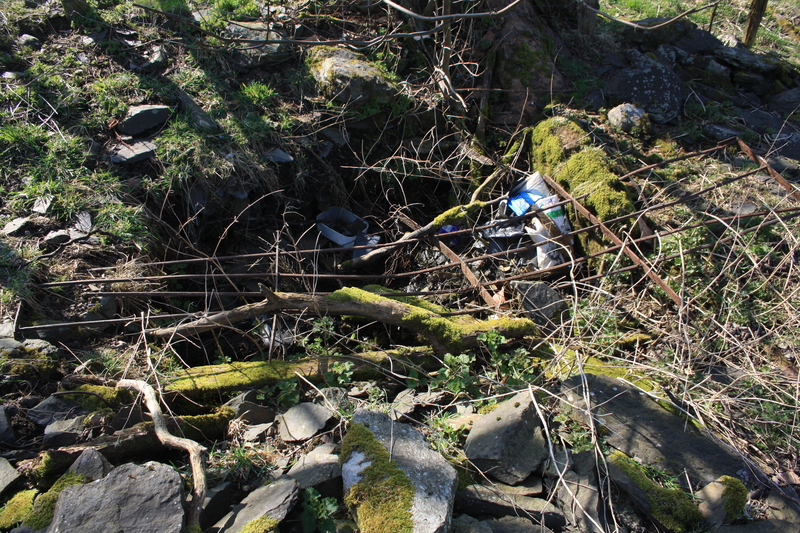 However, at the same time it seems to be a convenient local dumping ground, we found several buckets and tin cans in it, together with a number of rotting plastic sacks. However, at the bottom of it all, under all the litter, there was still water, albeit stagnant and smelling, in the well. The well basin measures about 6 feet by four feet, on three sides it is constructed of dry stone walling, the fourth side made up with a couple of massive stones stuck upright into the ground. Apparently at one time there were steps leading down into the basin. There is other stone scattered around on the surface around the well, presumably the remains of the recent attempts to restore it. 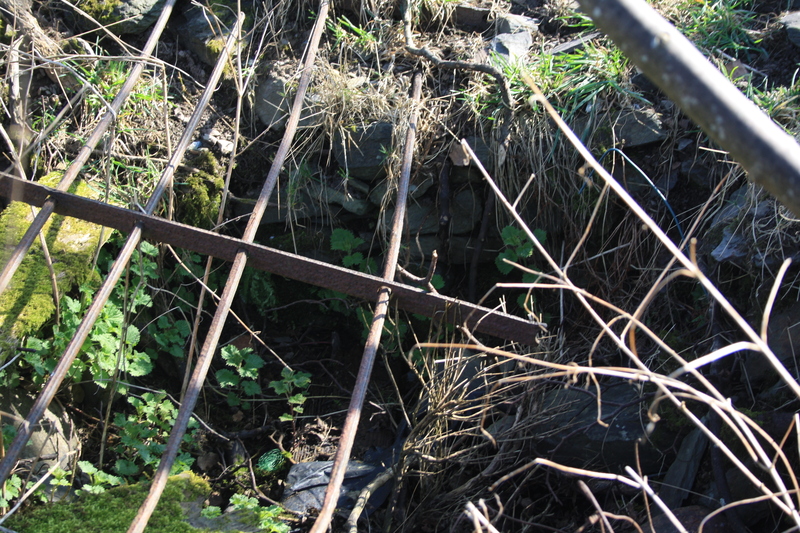 The well is covered over in part by fallen iron fencing. It is enclosed on three sides by rough masonry, and on the fourth side by two upright stones, at the bottom of one of which is a semi-circular hole for the overflow. Three steps at the north west corner lead down to the water. The enclosure is 6 feet 9 inches by 4 feet 6 inches; it is not and apparently never has been covered. The well is kept in good condition by the owner. The village is situated on a gentle eminence, and was formerly a thoroughfare on the great Irish road, which, by an improvement in the route, was afterwards diverted to a short distance from it, but still passes for several miles through the parish. The traffic on this line of road has much diminished since the opening of the Chester and Holyhead railway, in 1848. A post office has been established here. A market was at one time held on Friday, but it has fallen into disuse: fairs take place on March 14th, April 27th, August 24th, October 20th, and December 7th. Much of the surrounding land was let off to farmers from further north and west who used it as a stopping off point for drovers heading to the English markets. When we visited it in March 2012 it retained this sense of closure, typical of so many villages these days, the one remaining village centre pub, The White Lion,closed its doors last year, and a number of shops around the central square, a general dealer and a butcher seemed to be no longer trading. To be fair, though, since then the pub has reopened with new owners and maybe things aren’t as dour as I paint – I’m overdue another visit. St Mary Magdalene’s church lies at the centre of the village, its notice board welcomes visitors to come inside with the promise of useful leaflets on things to do in the area; it was firmly locked this Sunday afternoon. Maybe this is a necessary precaution, a local legend recalls the time when the devil himself took up residence inside the church and it took a team of oxen to drag him out again, one can’t be too careful I suppose. 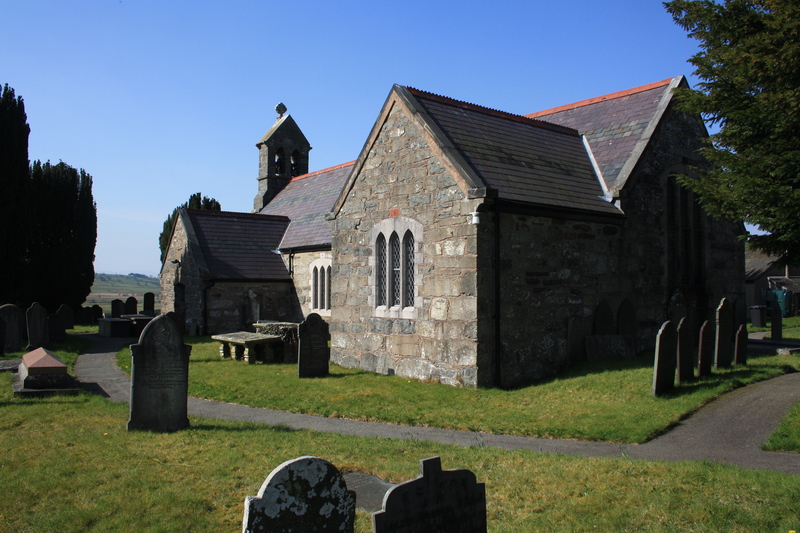 The church was reputedly founded by Ieuen Gwas Padrig; a true Welsh saint who hailed from Llahrhaiadr, he was a disciple of St Patrick, hence the nickname Gwas Padrig – the servant of Patrick. His life history records him as a miracle worker from a young age, reported to have banished adders from the neighbourhood and driving crows from his father’s barn. His father was so impressed that he sent him to study pest control with St Patrick, whom he eventually followed to Ireland. Patrick soon recognised Ieuan’s miracle working skills, and reluctant to deprive Wales of such a saint sent him back. With a lack of forethought it is told that there was no ship available to carry him home, but, nothing daunted, Ieuan prayed and soon saw a blue slab floating on the water towards him, he boarded it and was carried safely to Anglesey. He returned home to be instructed by an angel to walk southwards until he spied a roebuck, at that point he was to establish his cell, This instruction led him to Cerrigydrudion where he established the church that he himself was said to have dedicated to St Mary Magdalene. This is supposed to have been around the year 400. The church may at one time have been dedicated to both Mary and himself and according to Lhuyd, prior to the Reformation St Ieuan Gwas Padrig was depicted in medieval stained glass at the church. There are a number of named wells cited by Francis Jones in the area. The St Mary Magdalene’s well described above lies close to the church, it is situated at the base of a large tree and is accessed by accessed by a very short walk on a public footpath close to a new road suggestively called Maes-y-Ffynnon. However an earlier well, dedicated to the same saint, was said to be at Caeu Tudur. Lhuyd  also mentions Ieuan’s own Holy Well, which was said to possess very cold water which cured swelling in the knees, and yet another well Ffynnon y Brawd – the Friars’s Well – which was resorted to for the removal of warts. Both these are also mentioned in Jones. 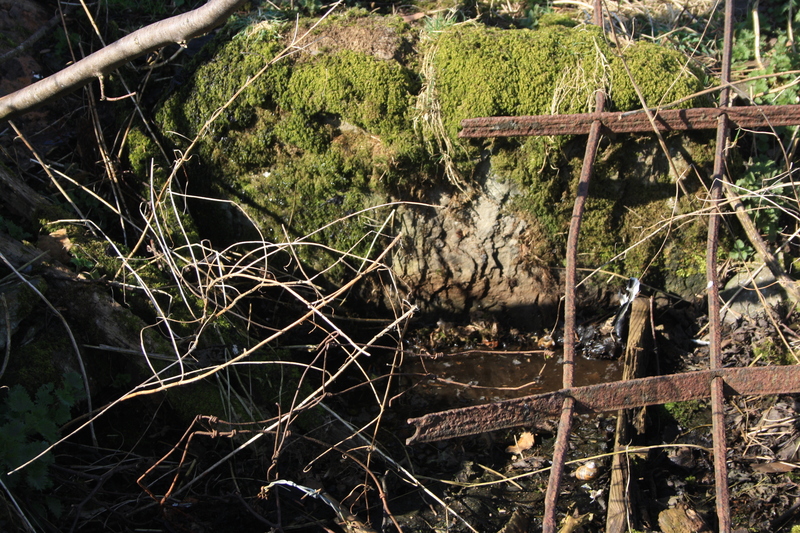 Although it has been suggested that the well currently referred to as St Mary Magdalene’s was originally St Ieuan Gwas Padrig’s well , however information I have recently received identifies Ieuan’s well at some distance from Cerrigydrudion and this well will be the subject of a new post in the near future. St Mary Magdalene’s day is celebrated on July 22nd. The photos from this visit are quite disappointing and don’t show much detail of the well basin. I shall try to get some better ones next time I’m passing, if I can remove the fence that covers it for a while.